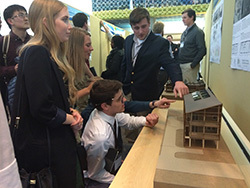 After months of designing, evaluating, computer modeling, writing comprehensive reports and preparing presentations, the 20-person team traveled to the headquarters of the National Renewable Energy Lab (NREL) for the competition, held in Denver April 16-17, to present their "suburban single family detached house" design concept. Winning designs were evaluated in 10 different categories, including architectural design, interior design, energy analysis and innovation. The App State team was selected as one of four grand finalists from 31 other university teams. This is the second year an Appalachian State University team has taken home a grand finalist award. Associate Professors Dr. Christof den Biggelaar (Sustainable Development) and Dr. Dennis Scanlin, (Sustainable Technology and the Built Environment), along with sustainable development graduate student Jonathan Fannon, worked with a group of sustainable technology graduate & undergraduate students to design and build a 2 KW Photovoltacis system mounted on a low cost, custom made, elevated rack made from locally harvested and milled lumber. 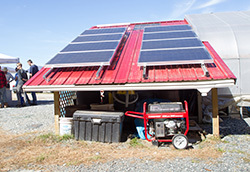 The elevated solar panels provide partial shade for crops, and the electricity generated will be used to power a refrigeration system for crops grown on the farm. Assistant Professor Mark Nystrom is using his art to call attention to the carbon footprint left by all humans. By using a carbon calculator, he designed "My Daily Contribution to Global Warming", a visualization of his daily carbon footprint measured in pounds. 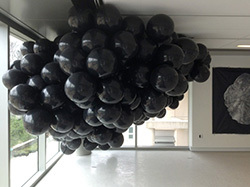 The exhibition uses large black balloons to hold a volume of air equivalent in weight to his daily footprint. The balloons are then suspended from the ceiling in a gallery for visitors view. He often provides a computer with his exhibition where visitors can calculate their own footprint in pounds per day and balloons per day compare it to his footprint and a randomly chosen average citizen of different countries. 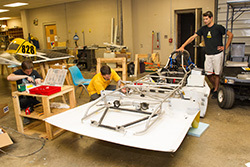 Students in the Department of Sustainable Technology and the Built Environment and the Department of Physics are working together to build the Apperion, Appalachian State's first solar-powered racing vehicle, to compete at the Formula Sun Grand Prix (FSGP) and the American Solar Challenge (ASC) this summer. Dr. Jeremy Ferrell is the lead faculty advisor and works closely with the team to research and test vehicle performance. The FSGP is a track race held in Pittsburg, Pennsylvania where teams complete as many laps as possible in three days. This race serves as a qualifier for the ASC, an eight-day road race stretching more than 1800 miles from eastern Ohio to South Dakota. The team will compete against 27 different colleges and universities from around the world. Jeanne Mercer-Ballard's professional interior design work has a sustainable focus. She is currently completing a microbrewery project in Charlotte that utilizes salvaged and reclaimed materials, including wood pallets, toilet tank lids, existing lumber, salvage furniture, and existing steel beams. Mercer-Ballard was also heavily involved in the building of the new LEED Silver-certified Watauga High School, including LEED consulting, finishes and material selection, and the environmentally-sensitive furniture package, which earned a LEED point for the school. 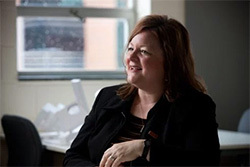 Mercer-Ballard was appointed to the Board of Directors of the USGBC NC (United States Green Building Council) in December and elected Secretary in December. IlaSahai Prouty, assistant professor in the Department of Art, is determined to expand the dialog about race and stereotypes at Appalachian State University. 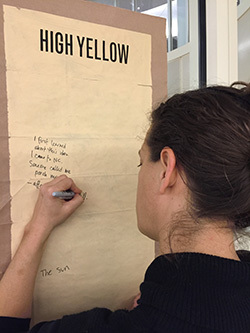 Her recent art installation, "Paper Bag Test – Boone," was designed to present race as a social construct and engage students, faculty, staff and the community in thinking about how words describe, imply and evaluate race. The paper bag test is said to have been used to evaluate who might be admitted into certain African-American clubs, organizations and parties. People darker than a paper bag were welcome while those lighter were directed to others. As a bi-racial woman, Prouty lives with the question of how race is constructed in our culture. Her recent work is driven by the themes of identity, power, repetition and dreaming. In addition to encouraging the community to think more deeply about race, Prouty asked viewers to reflect on how they see their own skin tone and the skin tones of others, and to present race as a social, as opposed to a scientific, construction. Prouty's "Paper Bag Test" has been hosted at Greensboro College, High Point University, East Tennessee State University and The Massachusetts College of Liberal Arts. She is planning to create a book using the comments and selfies provided by participants from the various installations. Prouty received her MFA from the California College of Art in the Bay Area. She teaches Art for Social Change, Senior Studio and other courses. 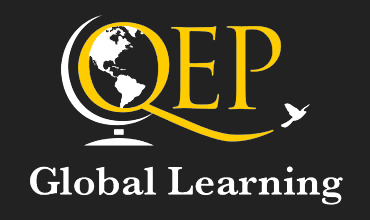 She is co-author of three books about experiential education, and trains people on facilitation techniques through Project Adventure Inc.